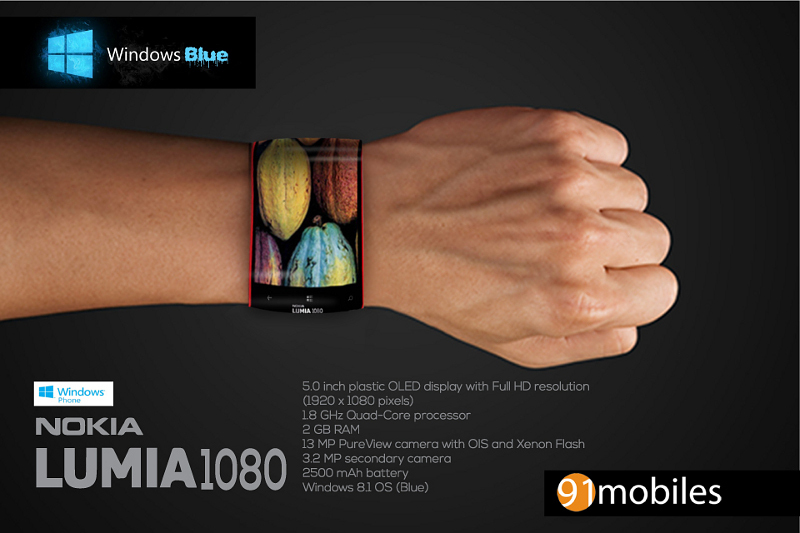 Just a quick post to introduce you to the Nokia Lumia 1080 Windows Phone concept tipped by our friends at 91mobiles. This smartphone features a flexible OLED screen and special layered circuitry that allows you to bend it over your wrist. This wearable device is not short of specs either, sporting a whooping 5" display, a 1.8Ghz Quad Core CPU and, of course, the latest and greatest version of Windows Phone: WP 8.1 (aka Windows Blue). Fancy an expensive wristband for Xmas? Skip the boring smartwatches and... keep dreaming (although this wearable form factor might come sooner than expected).